Would you like to resell vooPlayer? To view example of completely re-branded Watch Page, please refer to this article. 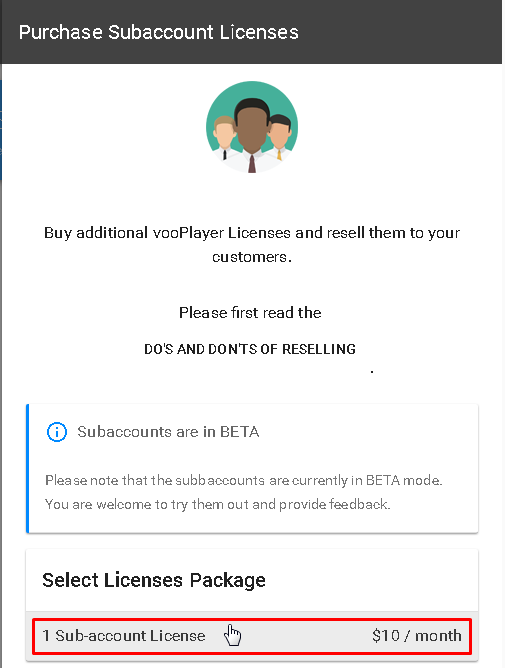 For reselling the vooPlayer, we are offering the White Label option with the current price of $10 per month for each Sub Account and you are the decision maker of the reselling price. It is necessary to own the ENTERPRISE license in order to resell the vooPlayer. Please keep in mind if you use this option, you must White Label everything. No mention of vooPlayer should be used in your marketing materials or anywhere at all. Another important thing to mention is that we are not offering any kind of support for Sub Account users, only for your "Master" account. You buy a regular account and for each customer you sublet a limited account which you control. Your clients have their own login credentials and they only have access to their own videos. Master account i.e. you will be able to control all of them. There are options to add your custom domain and logo to completely re-brand the vooPlayer. Furthermore, you should setup your site and purchase additional Sub-Account licenses. 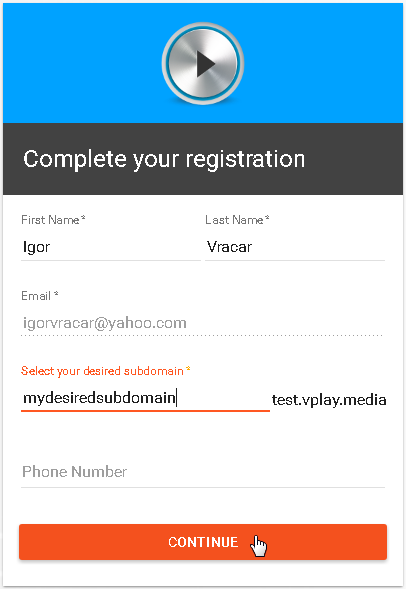 Before starting make sure your custom domain DNS is set as an alias of app.vooplayer.com either as an A or CNAME record. To achieve this, go to My Site & Clients and click on START RESELLING. You will see the list of currently available packages, choose the one that suits your needs. Whenever you see the blue exclamation mark icon, you can click on it and it will show you the corresponding article from our Knowledge Base. In this case it will show you the article Setting Up a Custom Domain. 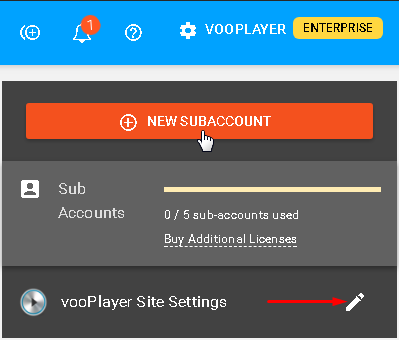 We have recently enabled the Custom Code for your site, so when you are reselling vooPlayer you can make some finest adjustments. For example, you can use the Bablic translation service to translate the important elements of a page without modifying them by integrating a short code. This preserves the function of the page but it is readable in another language. 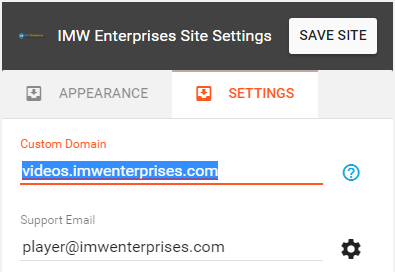 Now, define your site Title, add your Logo as image or URL, improve your site's style by matching the color, fill in domain and support email and click on CREATE SITE. You will receive a pop-up message that your site is successfully created and will now be able to add some new Sub Accounts. 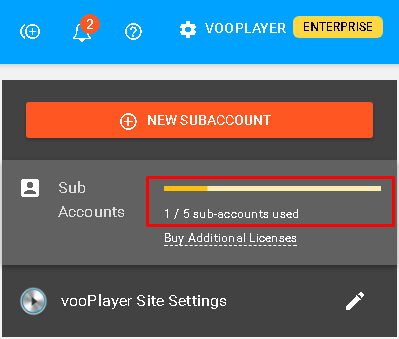 The info about available sub-accounts is displayed here and if necessary, you can buy some more if you click on "Buy Additional Licenses". Clicking on the pen icon will allow you to re-define your site settings. 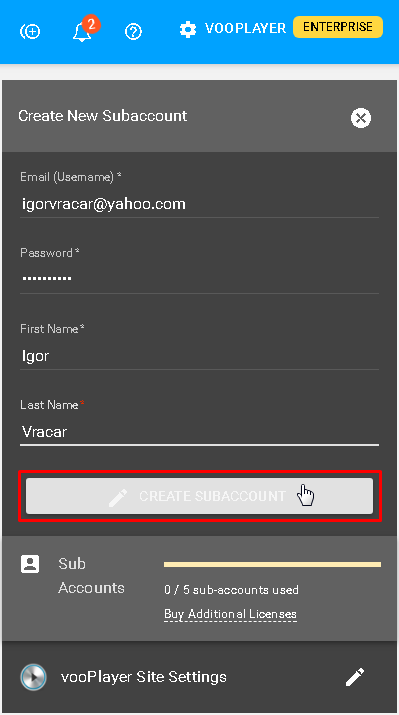 To create a Sub Account, just click on the NEW SUBACCOUNT button, fill in all information and click on the CREATE SUBACCOUNT. A pop-up window will appear to inform you that the Sub-Account is successfully created. 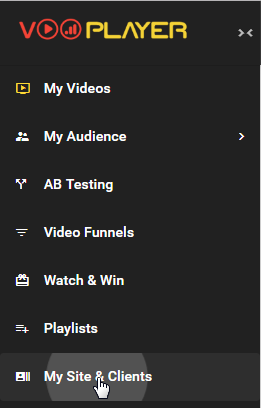 Here are options to update or delete that Sub-Account. 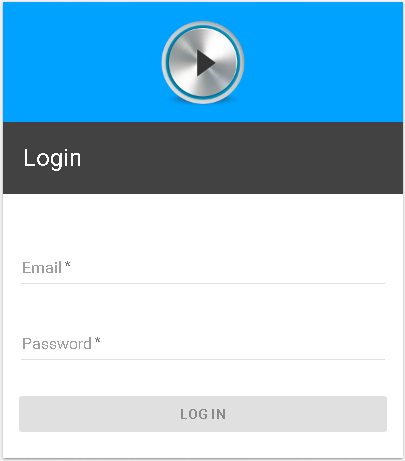 Now a user just needs to complete his/hers registration and can start using the application. Every Sub-Account will have the ENTERPRISE license with 10 GB of Storage and 10 GB of bandwidth included. If your customer needs more Storage or Turbo Bandwidth he/she can request this from YOU in the application interface and you will receive these requests as new notifications. It is up to you to approve/disapprove any request and all approved amounts of Storage space or Turbo Bandwith will be deducted from your (Master) account. Prices for the Turbo Bandwidth are $20 for 100GB, $80 for 500GB, $120 for 1TB. This one-time payment rolls over to next month if not used. Of course, you are reselling Storage and Bandwidth as well, so you can determine at which prices. Kindly note that charging your clients is not related to our system, you can charge them on the way you prefer (PayPal for example).